Does Organic Production Result in Lower Protein Content? Environmental conditions impact grain quality parameters. For example, soil available nitrogen can affect protein content. Do organic management practices result in lower protein content? If that’s the case, is the end product quality at risk? Researchers from Washington State University and Montana State University compared quality of organic versus conventional wheat. Their findings on protein content are presented in this post. In Montana, scientists looked at hard red spring wheat. Protein content of hard red wheat tended to be lower in organic than in conventional systems, but that was a consequence of fertility regime: if the organic crop was preceded by winter pea instead of spring pea, the gain of soil nitrogen was enough to bridge the protein % gap with conventionally grown wheat. Researchers also looked at bread loaf volume, which is directly related to protein content. Again, it tended to be lower (a sign of low protein content) for organically grown wheat, but bread loaf volume from high-fertility organic systems was as high as bread loaf volume from conventional systems. In Washington, researchers compared soft white winter wheat produced under conventional and organic systems. Protein content was lower for wheat grown in low-fertility organic systems. It was equivalent for conventionally grown wheat and wheat grown under a high-fertility organic regime. Low protein content is desirable in soft wheat, as it results in higher sponge cake volume (a typical end-product of soft white wheat flour). 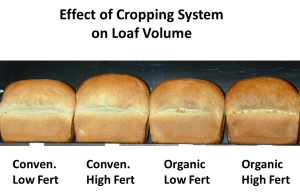 For soft white wheat, low-fertility organic practices had the advantage: they resulted in a low protein wheat which produced a high volume sponge cake. To bank on highest quality for all class of wheat, sound organic practices should supply as much nitrogen as possible for a hard red wheat crop, and less so for a soft white wheat year. Use your rotation to achieve this tough challenge: if using cover crop to supply nitrogen to your organic system, follow the cover crop with hard red wheat to capture a maximum of the protein and the premium. Have a soft white following the hard red to take advantage of the diminished nitrogen supply. You can also consult the Soil Management page for more information on cover crops and soil nitrogen in organic systems.